I recently completed restoring a 1949 Dexter. I picked this watch up in my favorite local shop. It was missing it's crown, not running and had a very poorly refinished dial. So poor, in fact, that I wasn't sure that it was even a Hamilton design pattern. The Dexter was originally introduced in 1949 and produced for three years. Another Dexter was introduced 10 years later - but that's a totally different model. The Dexter came in a 14K gold filled case in yellow. 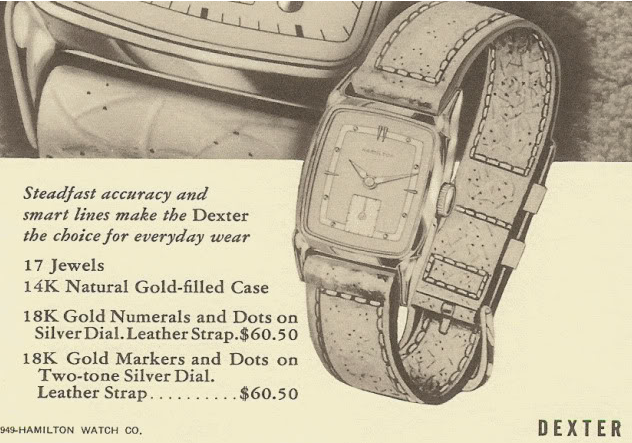 Two dial options were available, the solid gold numeral dial with dots or the marker dial with dots. Both dials are butler finished sterling silver. The marker dial has a two-tone finish. Under the dial you will find the 17 jewel, 8/0 sized 747 movement. I think most of the Dexters that I have come across have shown at least a little bit of wear through to the tops of the lugs. Usually the rest of the case seems to hold up well. Unfortunately, I neglected to take a "before" shot of my recently completed project watch. 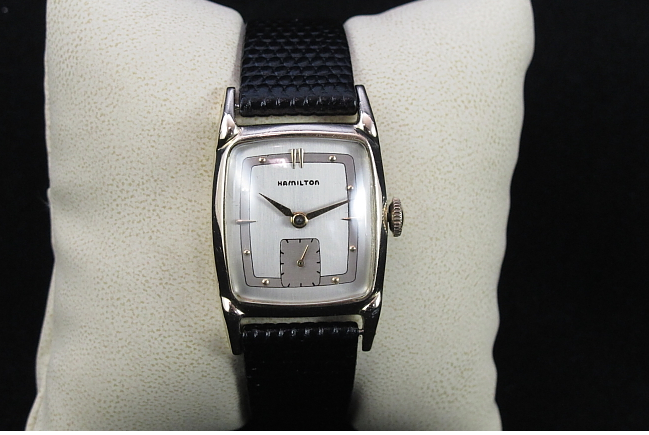 This Dexter needed a lot of TLC to come back to life but with a new glass crystal and a professionally refinished dial, I think it turned out fantastic. 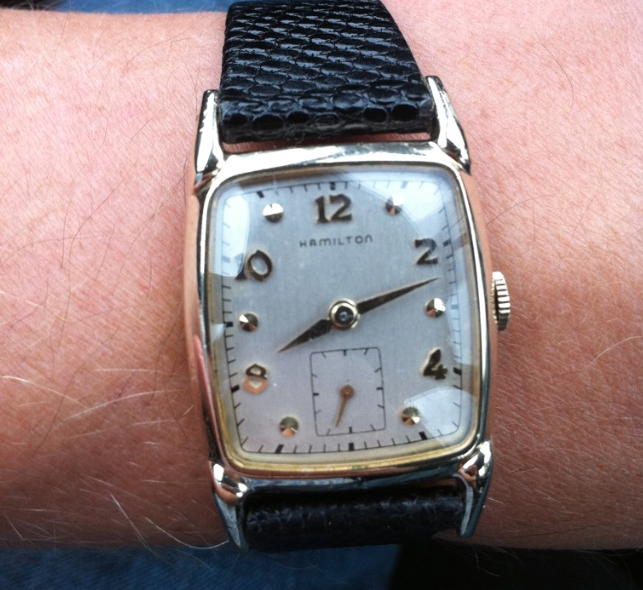 Here's a wrist shot of the numeral dial - I think this is the more common dial pattern that you will find out there. 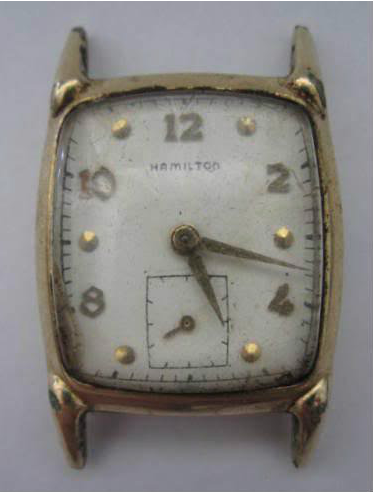 While looking for other photos I came across another project watch that was pretty much the same as the one I just completed - although with a numeral dial. Note in this before shot that this watch is missing it's crown as well. I no longer have this watch but looking at it now I would say the dial is likely an older refinish but it cleaned up very well, as you can see in this "after shot" of the same watch. 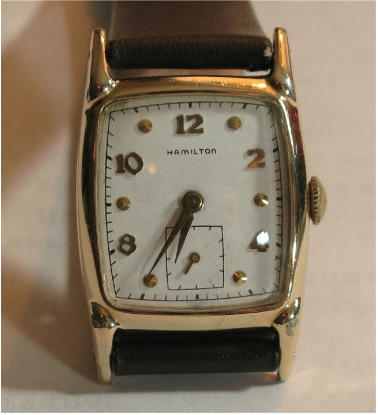 Thanks for the info about the Hamilton Dexter. Myine is the numeral dial. I had it professionally redone about 10 years ago. My mon said she bought it for my dad in 1944 when they were living there for a short while. but she is 96 so may be mistaken on that. My question for you is.about the band. Currently i have sort of a polished brown leather band. To be period correct should it be more of a flat distressed type of military band. I'm only going from the add that appears on your page.. If you send me an email I will be glad to send u a pic of my watch. The 747 movement came out in 1947 so it's not going to be earlier than that. Plus production during WWII was dedicated to the war effort. Regardless, it's great to have a family keepsake. Originally it would have had a stitched pigskin strap. Various colors were available but normally it's a tan / light brown color. Of course, as far as straps go, whatever you find most comfortable is what you should put on it - that way you'll enjoy wearing it.